In the $2,100 Event, play is down to three handed. Mike Heshmati was eliminated in 4th place, and it looked as if Brad Gordon was going to be eliminated in 3rd place. Yanki Koppel was all in on a J-T-9 flop with a set of nines, which had outflopped Brad's pocket kings. Brad failed to improve, and after doubling up his opponent, he was left with just over ten big blinds. A few hands later, Ryan D'Angelo called Brad's check-raise allin with [Ks]Kd], and Brad was in bad shape with [Qc][Js] on a [8h][2h][Jh] flop. 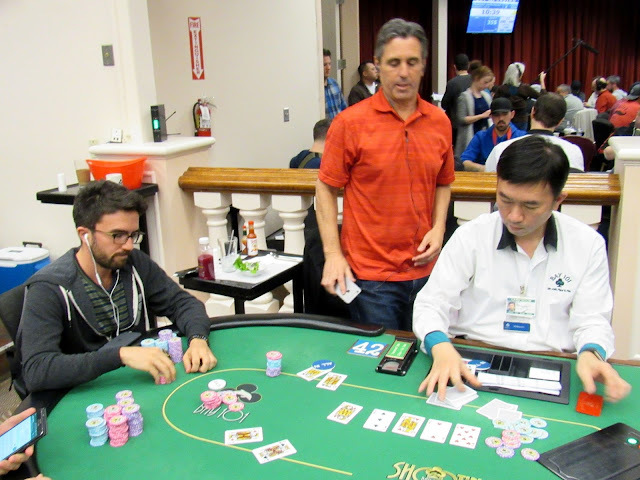 The [3s] on the turn had Brad out of his chair and packing up, but the [Qd] river gave Brad the winning two pair. He will double up to 444,000 and play will continue three handed.